On Oct. 29, Marist College’s English Department hosted the Annual George Sommer Lecture that was originally established after the Marist Professor’s retirement to allow the English Department to bring a top scholar to Marist to engage with the students. Currently Marist’s English Department uses the lecture to highlight various scholars in a cycle. Normally the college will host a Chaucer or Shakespeare scholar one year, choose to highlight any English Scholar the next year and then to highlight a Modern Language Scholar the third year. This year’s George Sommer Lecturer, Dr. James Shapiro of Columbia University, not only enlightened attendees about the influence of Shakespeare but also took time to interact with students through a Master Class on the Shakespearean Sonnet. The topic of this year’s Sommer Lecture. Shapiro, a Larry Miller Professor of English and Comparative Literature at Columbia University since 1985, is also a published author of six Shakespeare books, the latest inspiring the topic for this year’s annual George Sommer Lecture: Shakespeare in America. Dr. James Shapiro speaking on to a crowd in the Fusco Recital Hall on Shakespeare’s influence in America. Shapiro was not only a high energy speaker but a fun individual starting off the night with an approximation of the lecture’s length, abandoning the microphone because he “likes to shout” and entertaining questions from students after the lecture. Shapiro fielded questions regarding his relationship to Shakespeare, why Shakespeare is studied in ways other playwrights are not, and what he believed the most famous Shakespeare play was. Rose was also one of many students who attended Shapiro’s earlier Master Class on the Shakespearean Sonnet that Shapiro himself proposed to Marist Professor Dr. Gregory Machacek, who was in charge of this year’s Sommer Lecture. The Master Class let Marist Students get a chance to not only learn from Shapiro but gave them a better chance to get to know him. 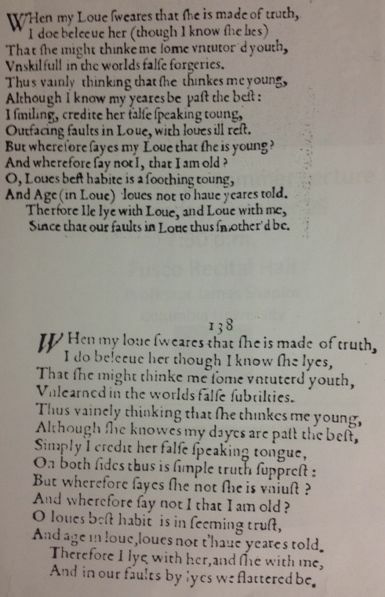 The two sonnets Shapiro used in his Master Class for undergraduates. Shapiro guided those in attendance through the changes between an earlier, and unauthorized publication of Shakespeare’s “Sonnet 138” to the changes seen in a later version of the same sonnet. “This poem has turned into a poem about what you get when you suppress the simple truths,” Shapiro said to students. It followed the idea that relationships look bad from the outside because friends don’t understand the relationship. And following the end of the Master Class, Shapiro took the time to stay and talk with students informally before the lecture later that evening. “He told me later that it [the class] allows him to get a feel for the students and maybe adjust his lecture a little bit so that he is delivering it to their capacities and their interests,” Machacek revealed the next day. 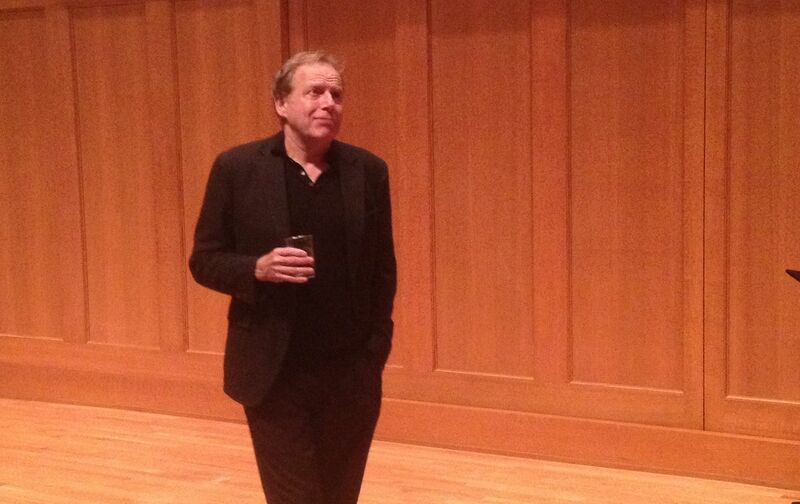 Shapiro proved to be a hit with students and attendees of the lecture in general. 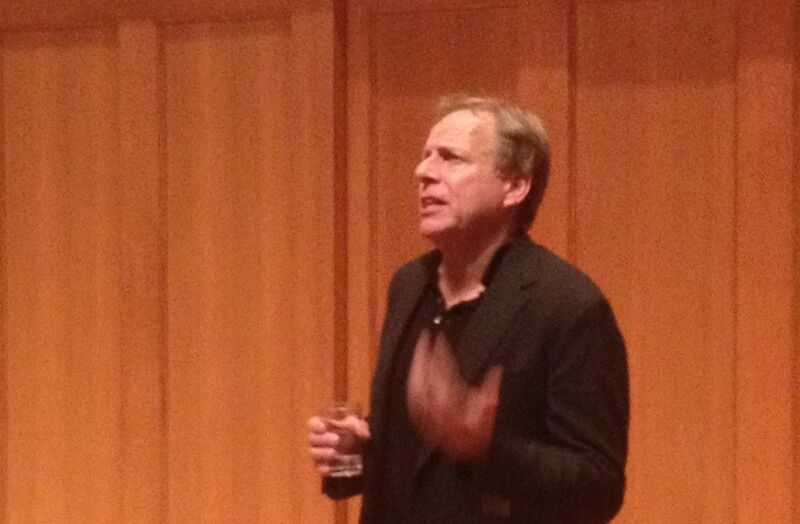 Shapiro entertained questions after the lecture from a variety of students. Machacek said he cannot remember the last time a lecture had the amount of good questions asked as Shapiro’s did. 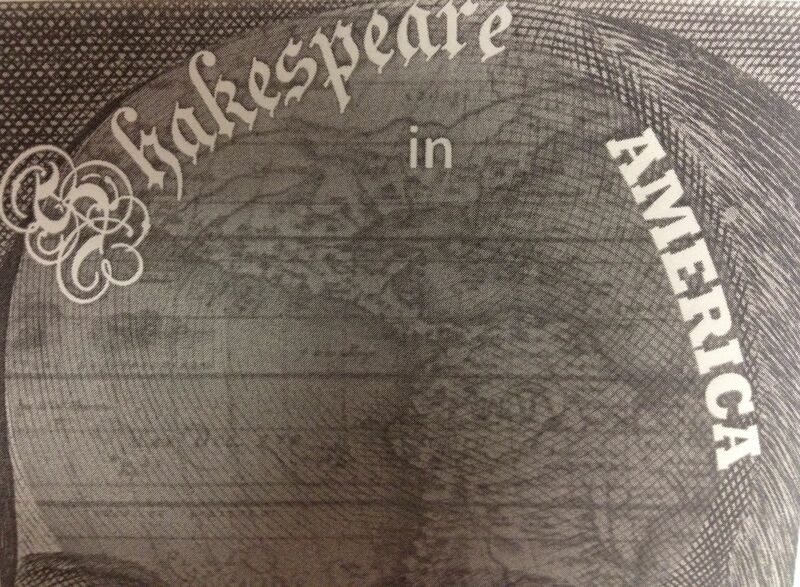 This entry was posted in On Campus and tagged #Marist, George Sommer Lecture, James Shapiro, Shakespeare, Sonnet. Bookmark the permalink.